Wine grape vines display beautiful fall colors. 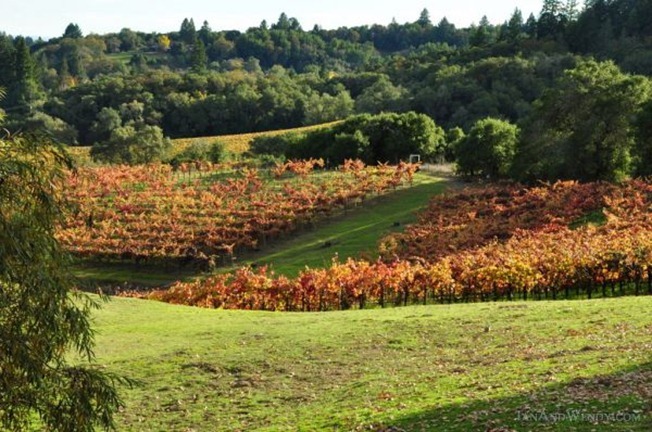 Today was an absolutely perfect fall day in Sonoma County. Sunny and warm, with the highs in the high 70s (25C), it was the perfect day to head out into the spectacular Dry Creek Valley. The grapes are in full fall colors with brilliant splashes of red and yellow painting the valley in vibrant color. 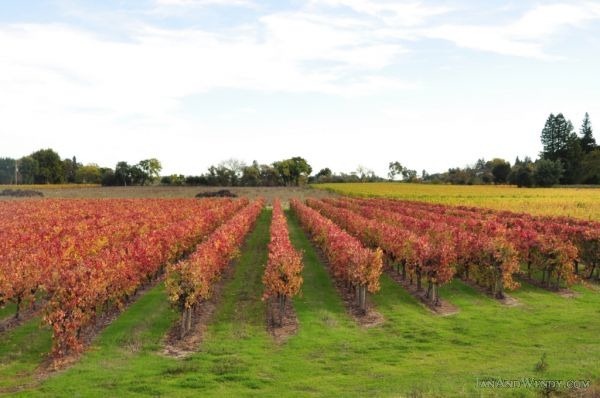 The grapes themselves have all been harvested and are on their way to making this year’s new wine, but the foliage remains for now, putting on a spectacular show for visitors to the regions numerous wineries. 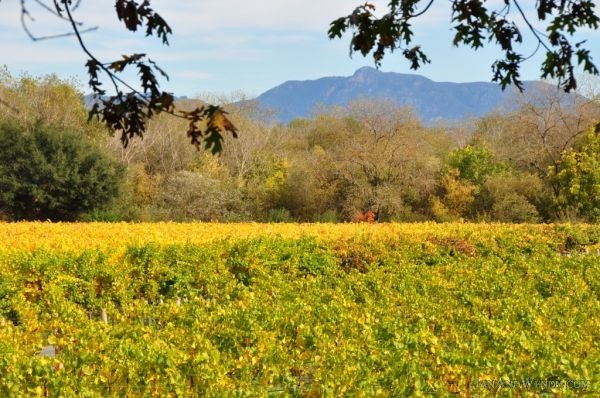 We started out at a familiar favorite – Armida Winery. We’re wine club members there, and so we started by picking up our latest “shipment” – a fabulous Pinot Noir and a fruit forward Zinfandel. Of course, while we were there we just had to some wine tasting! We didn’t expect to discover any new wine, but it turned out they were pouring several older vintages of their wine that we hadn’t tried before. It was a great opportunity to try some older wines, and we took full advantage! We discovered some great new wine and we’ll be blogging about it soon. We enjoyed a leisurely picnic lunch, drinking in the sweeping views of Dry Creek Valley from Armida Winery along with some of their delightful Sauvignon Blanc. Sitting under the beautiful old oak tree that grows up straight through their expansive deck, soaking in the warm rays of the Sonoma County sun and munching on good food washed down with delicious wine – life really doesn’t get much better, does it? After lunch we checked out a new winery we’ve passed a couple of times and had been wondering about. The Michael Bernard Tasting Room hasn’t been open for very long – it’s grand opening was only October 9th. 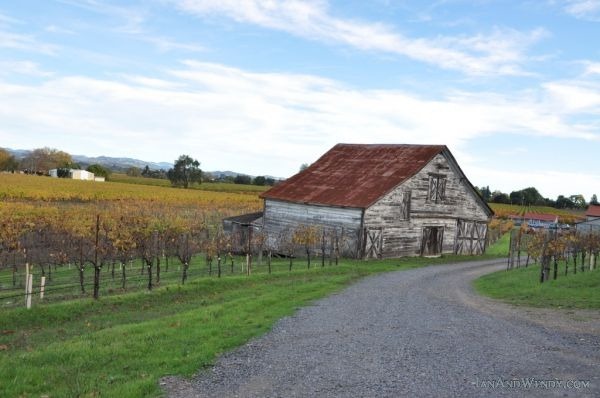 We really didn’t have very high hopes for the wine – after all, there are a LOT of tasting rooms in wine country! We were VERY pleasantly surprised by the wine, however, and a bottle of sparkling wine (aka California “Champagne”) and a fabulous bottle of a very big, bold and delicious Cabernet Sauvignon came home with us. We’ll blog more about that soon! 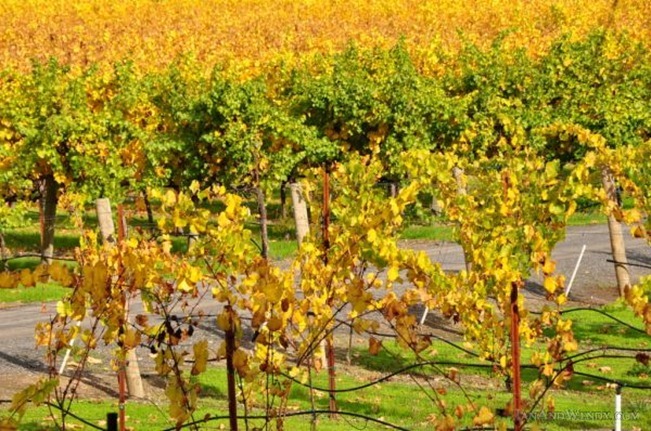 Wine grape vines turn brilliant shades of red and yellow carpeting Dry Creek Valley in fall color. The warm weather is supposed to continue through most of the week and the fall colors are truly a blaze of glory in the valley right now. So, if you’re in the area, or can be, add wine tasting to your plans for the week! You’ll be glad you did! Cheers!